The Latin name Libya (from Greek Λιβύη, Libyē) referred to the region west of the Nile generally corresponding to the Atlantic Mountains according to Diodorus . 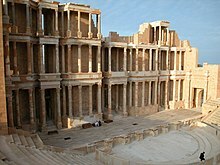 Its people were ancestors of the modern Libyan. They occupied the area for thousands of years before the beginning of human records in ancient Egypt. Climate changes affected the locations of the settlements. More narrowly, Libya could also refer to the country immediately west of Egypt, viz Marmarica (Libya Inferior) and Cyrenaica (Libya Superior). The Libyan Sea or Mare Libycum was the part of the Mediterranean Sea south of Crete, between Cyrene and Alexandria. In the Hellenistic period, the Berbers were known as Libyans, a Greek term for the inhabitants of the Maghreb. Their lands were called "Libya" and extended from modern Morocco to the western borders of ancient Egypt. Modern Egypt contains the Siwa Oasis, which was part of ancient Libya. The Siwi language, a Berber language, is still spoken in the area. The Greek name is based on the ethnonym Libu (Ancient Greek: Λίβυες Líbyes, Latin: Libyes). The name Libya (in use since 1934 for the modern country formerly known as Tripolitania and Barca) was the Latin designation for the region of the Maghreb, from the Ancient Greek (Attic Greek: Λιβύη Libúē, Doric Greek: Λιβύᾱ Libúā). In Classical Greece, the term had a broader meaning, encompassing the continent that later (second century BC) became known as Africa, which, in antiquity, was assumed to constitute one third of the world's land mass, compared to Europe and Asia combined. The Libu are attested since the Late Bronze Age as inhabiting the region (Egyptian R'bw, Punic: 𐤋𐤁𐤉 lby). The oldest known references to the Libu date to Ramesses II and his successor Merneptah, pharaohs of the Nineteenth Dynasty of Egypt, during the 13th century BC. LBW appears as an ethnic name on the Merneptah Stele. Menelaus had travelled there on his way home from Troy; it was a land of wonderful richness, where the lambs have horns as soon as they are born, where ewes lamb three times a year and no shepherd ever goes short of milk, meat or cheese. Homer names Libya, in Odyssey (IX.95; XXIII.311). Homer used the name in a geographic sense, while he called its inhabitants "Lotus-eaters". After Homer, Aeschylus, Pindar, and other ancient Greek writers use the name. Herodotus (1.46) used Λιβύη Libúē to indicate the African continent; the Líbues proper were the light-skinned North Africans, while those south of Egypt (and Elephantine on the Nile) were known to him as "Aethiopians"; this was also the understanding of later Greek geographers such Diodorus Siculus, Strabo, etc. When the Greeks actually settled in the real Libya in the 630s, the old name taken from the Egyptians was applied by the Greeks of Cyrenaica, who may have coexisted with the Libu. Later, the name appeared in the Hebrew language, written in the Bible as Lehabim and Lubim, indicating the ethnic population and the geographic territory as well. In the neo-Punic inscriptions, it was written as Lby for the masculine noun, and Lbt for the feminine noun of Libyan. Latin absorbed the name from Greek and the Punic languages. The Romans would have known them before their colonization of North Africa because of the Libyan role in the Punic Wars against the Romans. The Romans used the name Líbues, but only when referring to Barca and the Libyan Desert of Egypt. The other Libyan territories were called "Africa". Classical Arabic literature called Libya Lubya, indicating a speculative territory west of Egypt[clarification needed]. Modern Arabic uses Libya. The Lwatae, the tribe of Ibn Battuta, as the Arabs called it, was a Berber tribe that mainly was situated in Cyrenaica. This tribe may have ranged from the Atlantic Ocean to modern Libya, however, and was referred to by Corippius as Laguatan; he linked them with the Maures. Ibn Khaldun's Muqaddimah states Luwa was an ancestor of this tribe. He writes that the Berbers add an "a" and "t" to the name for the plural forms. Subsequently, it became Lwat. Conversely, the Arabs adopted the name as a singular form, adding an "h" for the plural form in Arabic. Ibn Khaldun disagrees with Ibn Hazam, who claimed, mostly on the basis of Berber sources, that the Lwatah, in addition to the Sadrata and the Mzata, were from the Qibts (Egyptians). According to Ibn Khaldun, this claim is incorrect because Ibn Hazam had not read the books of the Berber scholars. Compared with the history of Egypt, historians know little about the history of Libya, as there are few surviving written records. Information on ancient Libya comes from archaeological evidence and historic sources written by Egyptians neighbors, the ancient Greeks, Romans, and Byzantines, and from Arabs of Medieval times. Since Neolithic times, the climate of North Africa has become drier. A reminder of the desertification of the area is provided by megalithic remains, which occur in great variety of form and in vast numbers in presently arid and uninhabitable wastelands: dolmens and circles like Stonehenge, cairns, underground cells excavated in rock, barrows topped with huge slabs, and step-pyramid-like mounds. Most remarkable are the trilithons, some still standing, some fallen, which occur isolated or in rows, and consist of two squared uprights standing on a common pedestal that supports a huge transverse beam. In the Terrgurt valley, Cowper says, "There had been originally no less than eighteen or twenty megalithic trilithons, in a line, each with its massive altar placed before it." In ancient times, the Phoenicians and Carthaginians, the Persian Achaemenid Empire (see Libya (satrapy)), the armies of Alexander the Great and his Ptolemaic successors from Egypt, then Romans, Vandals, and local representatives of the Byzantine Empire ruled all or parts of Libya. The territory of modern Libya had separate histories until Roman times, as Tripoli and Cyrenaica. Cyrenaica, by contrast, was Greek before it was Roman. It was also known as Pentapolis, the "five cities" being Cyrene (near the village of Shahat) with its port of Apollonia (Marsa Susa), Arsinoe (Tocra), Berenice (Bengazi) and Barca (Merj). From the oldest and most famous of the Greek colonies the fertile coastal plain took the name of Cyrenaica. These five cities were also known as the Western Pentapolis; not to be confused with the Pentapolis of the Roman era on the current west Italian coast. The exact boundaries of Ancient Libya are unknown. It lay[when?] west of Ancient Egypt and was known as "Tjehenu" to the Ancient Egyptians. Libya was an unknown territory to the Egyptians: it was the land of the spirits. To the Ancient Greeks, Libya was one of the three known continents along with Asia and Europe. In this sense, Libya was the whole known African continent to the west of the Nile Valley and extended south of Egypt. Herodotus described the inhabitants of Libya as two peoples: The Libyans in northern Africa and the Ethiopians in the south. According to Herodotus, Libya began where Ancient Egypt ended, and extended to Cape Spartel, south of Tangier on the Atlantic coast. Modern geographers suspect that Ancient Libyans may have experienced loss of forests, reliable fresh water sources, and game availability as the area became more desert-like..
After the Egyptians, the Greeks, Romans, and Byzantines mentioned various other tribes in Libya. Later tribal names differ from the Egyptian ones but, probably, some tribes were named in the Egyptian sources and the later ones, as well. The Meshwesh-tribe represents this assumption. Scholars believe it would be the same tribe called Mazyes by Hektaios and Maxyes by Herodotus, while it was called "Mazaces" and "Mazax" in Latin sources. All those names are similar to the name used by the Berbers for themselves, Imazighen. Late period sources give more detailed descriptions of Libya and its inhabitants. The ancient historian Herodotus describes Libya and the Libyans in his fourth book, known as The Libyan Book. Pliny the Elder, Diodorus Siculus, and Procopius also contributed to what is now primary source material on ancient Libya and the Libyans. Ibn Khaldun, who dedicated the main part of his book Kitab el'ibar, which is known as "The history of the Berbers", did not use the names Libya and Libyans, but instead used Arabic names: The Old Maghreb, (El-Maghrib el-Qadim), and the Berbers (El-Barbar or El-Barabera(h)). There were many Berber tribes in ancient Libya, including the now extinct Psylli, with the Libu being the most prominent. The ancient Libyans were mainly pastoral nomads, living off their goats, sheep and other livestock. Milk, meat, hides and wool were gathered from their livestock for food, tents and clothing. Ancient Egyptian sources describe Libyan men with long hair, braided and beaded, neatly parted from different sides and decorated with feathers attached to leather bands around the crown of the head while wearing thin robes of antelope hide, dyed and printed, crossing the shoulder and coming down until mid calf length to make a robe. Older men kept long braided beards. Women wore the same robes as men, plaited, decorated hair and both genders wore heavy jewelry. Depictions of Libyans in Egyptian reliefs show prominent and numerous tattoos, very similar to traditional Berber tattoos still seen today. Weapons included bows and arrows, hatchets, spears and daggers. The Libyan script that was used in Libya was mostly a funerary script. It is difficult to understand, and there are a number of variations. Herodotus divided them into Eastern Libyans and Western Libyans. Eastern Libyans were nomadic shepherds east of Lake Tritonis. Western Libyans were sedentary farmers who lived west of Lake Tritonis. At one point[when? ], a catastrophic change[clarification needed] reduced the vast body of fresh water to a seasonal lake or marsh. Ibn Khaldun and Herodotus distinguish the Libyans on the basis of their lifestyles rather than ethnic background. Modern historians tend to follow Herodotus's distinction. Examples include Oric Bates in his book The Eastern Libyans. Some other historians have used the modern name of the Berbers in their works, such as the French historian Gabriel Camps. The Libyan tribes mentioned in these sources[clarification needed] were: "Adyrmachidae", "Giligamae", "Asbystae", "Marmaridae", "Auschisae", "Nasamones", "Macae", "Lotus-eaters (or Lotophagi)", "Garamantes", "Gaetulians", "Mauri", and "Luwatae", as well as many others. ^ The Cambridge History of North Africa and the people between them as the Egyptians, p. 141. ^ Mohammed Chafik, Highlights of thirty-three centuries of Imazighen p. 9 . ^ Chaker, Salem. "L'écriture libyco-berbère (The Libyco-Berber script)" (in French). Archived from the original on 13 January 2010. Retrieved 5 December 2010. ^ Ibn Khaldun, The History of Ibn Khaldun: The thirth chapter p. 181-152. ^ "Gabriel Camps is considered as the father of the North African prehistory, by founding d'Etude Berbère[clarification needed] at the University of Aix-en-Provence and the Encyclopédie berbère." (From the introduction of the English book The Berbers by Elizabeth Fentres and Michael Brett, p. 7). Wikisource has the text of the 1911 Encyclopædia Britannica article Libya.